Cool, cool, cool. "First Shot" is the term commonly used to refer to injection molded figures, made just prior to full mass production, and often bearing distinctive mold features (such as a lack of dates and copyright markings). "Hard Copy," on the other hand, refers to a handmade figure created, not out of plastic, but from a cold-cast urethane material. Hardcopies commonly lack joint hardware, the figure's limbs and head being attached to the torso by metal or plastic pins, and feature a torso made from a solid piece, rather than from two distinct halves, which have been joined through a sonic-welding process. The figure on the left, however, represents an intermediate stage in the figure production process. Its made from injection-molded plastic, but, as you might be able to tell from this photo, its torso is one solid piece. Furthermore, its limbs are affixed via cylindrical plugs, which are extensions of the plastic used to make the arms, and which fit snugly into corresponding holes in the torso. What is it? 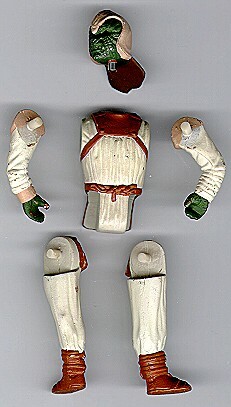 Well, by the time of the ROTJ toy line, Kenner had begun producing early-stage injection-molded figures entirely in-house, using relatively inexpensive, low yield aluminum molds. Such figures appear to have partially replaced traditional hardcopies, which both took a long time to produce and were very fragile. We've taken to calling these types of prototype figures "internal first shots," a term which emphasizes their having been produced wholly inside Kenner, as opposed to through an outside vendor, as standard first shots were. 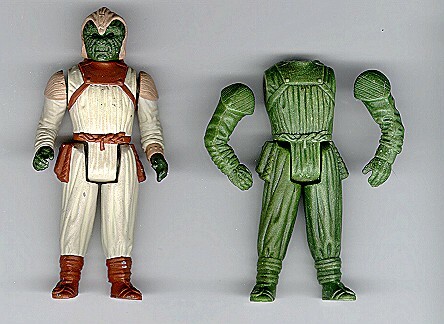 Here, you see two distinct production stages of the Klaatu Skiff Outfit figure. The piece on the right is an unpainted hardcopy (its missing its head, obviously), and the one on the left is the internal first shot. The differences between the two are actually very slight, something that cannot be said about the differences between a hardcopy and a more traditional type of injection molded figure. The paint on the internal first shot matches that of the production figure exactly, and, of course, it lacks copyright and date markings. The detail on the piece is quite good, but the injection molding process used to create it appears to have been somewhat crude; some bits have a rough texture to them, and the mold seams have been crudely filed down to make them less noticeable. Here you see a shot of the piece with the limbs and head removed. As you can see, the head is attached with the same type of metal pin used on most hardcopies. The limbs, however, feature the plastic plugs. In any case, its a neat piece, and one of some significance to those interested in how the vintage Kenner line was developed and produced.